How to "Beat the Dealer"? Blackjack card game attracts players who want to win big and prove to themselves that they are smart and able to "beat the dealer". The main idea of the game is to get as closer as possible to the 21 points without going bust which means not to exceed 21. It seems to be very easy at first sight, but in order to be successful, players have to learn how to play blackjack by memorizing the basic blackjack strategy and make use of blackjack tips given by experienced players. Being a very famous game, many successful players and blackjack theorists wrote hundreds of blackjack books with useful and helpful information. These books inspired many players to try their skills in this game. Moreover, there is one more great invention that is highly appreciated among the blackjack players. It is called the blackjack strategy chart. This chart appeared in 1958 after years of successful blackjack gaming ways investigation. The blackjack strategy chart was invented decade after the card counting, the most famous and effective cheating method in the history of blackjack. 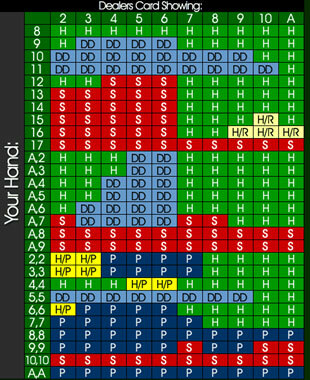 There are various blackjack charts specially designed for soft hand, hard hand and splitting pairs. But the above given chart helps players to make their decisions when playing. It is easy to understand the chart if players have the understanding of the blackjack game. The left column refers to the player's hand the horizontal column refers to the dealer's hand. In order to know what step to make, players can simply put the columns together and when they cross, they can see the offered step. H/P = Split but only if a player is allowed to double down afterwards. Otherwise - Hit. H/R = Surrender only if it's allowed. Otherwise - Hit. Players should keep in mind that this chart cannot guarantee the winning, it simply helps to make the decision. However, being very helpful, it is advised this chart to learn it by heart to increase the chances for winning!